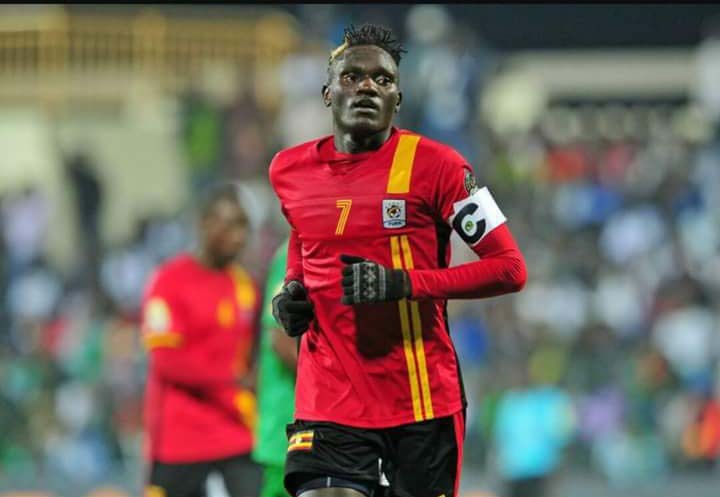 After months of speculation, Uganda Cranes left-back/winger, Joseph Ochaya has finally completed a move to Congolese giants TP Mazembe. The former KCCA star-player has been linked with the move since falling out with his Zambian club Lusaka Dynamo. Ochaya decided to terminate his deal with Lusaka two months ago, sighting non-payment issues and has since been linked with a move to the Lubumbashi money-bags. At Mazembe, he is believed to have signed a two year deal that will see him play his trade for the 16 time Congolese champions until 2020. “The TPM is pleased to announce the signing of Joseph Benson OCHAYA, read part of the statement on the club official website. He joins Sulaiman Mutyaba and Patrick Ochan on the list of players to have featured for five time CAF Champions League winners (including the African Cup of Champions clubs). Mazambe is Ochaya’s fourth professional club after previously featuring for Navibank Saigon (Vietnam), Asante Kotoko (Ghana) and recently Zambia’s Lusaka Dynamos. Tout Puissant Mazembe, formerly known as Englebert, is a Congolese football club based in Lubumbashi. Their home games are played at Stade TP Mazembe situated in the suburb of Kamalondo. Its nickname is Les corbeaux (theravens) despite having a crocodile with a ball in its mouth on the team crest. TP Mazembe drew an average home attendance of 11,888 in the 2015-16 Linafoot season.CS Don Bosco serves as a feeder club to the team. Mazembe are among the major sports clubs in DR Congo and one of the most successful football teams in Africa ever. They became the first Congolese club with 300,000 followers on Facebook, their main social media page. Tout Puissant Mazembe was founded in 1939 by benedicitine monks of the order of Sanctimonious Saint that directed the Holy Institute Boniface of Élisabethville (Lubumbashi). To diversify the student activities for those that did not consecrate themselves to the priesthood, the missionaries decided to set up a football team, named Saint Georges FC, after the patron of the Troop. This team affiliated itself directly in the first division of the Royal Federation of the Native Athletic Associations (FRASI for French Fédération Royale des Associations Sportives Indigènes) founded by the Belgian King. At the end of the season, Holy Georges placed 3rd. In 1944 the young scouts went on the road and FC St. Georges was rechristened Saint Paul F.C. Some years later, the incorporation of certain foreign elements in the Institute would make the missionaries abandon the team management. The team took the name of F.C. Englebert after its sponsor, a tire brand. The qualifier “Tout Puissant” (Almighty) was added to the club’s name after it went undefeated in winning its first league title in 1966. After the independence of Congo, (June 30, 1960) Englebert restructured itself. In 1966, they realized the treble (national championship, Coupe du Congo and Katanga Cup). In 1967 and 1968, it won the African Cup of Champions. The team would be finalist four times successively in (1967, 1968, 1969 and 1970). Mazembe was the first team to successfully defend the African Champions Cup. This feat was finally repeated in 2003 and 2004 by Enyimba. After 18 years of absence, it returned to the African scene thanks to 38-year-old governor Moise Katumbi Chapwe. In November 2009 the team won the CAF Champions League against Heartland 2–2 on aggregate, winning on the away goals rule. By winning the CAF Champions League, they qualified for the 2009 FIFA Club World Cup. In their first match in the quarter-finals they lost 2–1 to Pohang Steelers of South Korea despite taking the lead in the first half. Following a 3–2 defeat to Auckland City in the fifth placed match they finished the tournament in 6th place. In 2010 they retained the 2010 CAF Champions League, and in December they became the first African side to contest the final of the FIFA Club World Cup after defeating both Pachuca of Mexico 1–0 in the quarter-finals and Internacional of Brazil 2–0 in the semi-finals. In the final on 18 December, they were defeated 3–0 by Internazional of Italy. In 2015, TP Mazembe secured their fifth title in the competition after defeating USM Alger of Algeria 4–1 aggregate in the 2015 CAF Champions League Final.